Tonight I had the pleasure of attending a meeting held by EOARA (Eastern Ontario Artificial Reef Association). This was a meeting to show their plan to sink The HMCS Terra Nova in the area. The presentation also included a talk by Jay Straith, who is the President of the Canadian Artificial Reef Consulting group. The CARC have been sinking ships for the last fifteen years and are 22 for 22 in projects for sinking ships. One of their highlights is sinking four ships in five years in BC. The EOARA laid out their plan and goals for reaching there objective of having the HMCS Terra Nova as an artificial reef in the St. Lawrence. A spot has already been chosen just off Browns Bay Provincial Park. The spot is out of the shipping channel and allows for divers to use the existing provincial park. The EOARA has already started to contact various levels of government about the plan with everyone acting very favorable to this. Even though there is a current moratorium in Ontario dealing with artificial reefs the provincial government has indicated that they would like to proceed with this project and use it to set precedent for other artificial reefs in Ontario. It will also set precedent as being a fresh water artificial reef. Once the HMCS Terra Nova has been cleaned up on the east coast it will be floated up to Prescott where it will be docked for a period of 45-60 days as the final preparations are made to add this ship to the many other in the area. During the time in Prescott the ship will need the majority of its volunteers to make sure it is diver friendly. When she is sunk, The HMCS Terra Nova will have ten moorings on her and have access to all seven decks. The mast will be removed so the ship will start somewhere around the 50 ft mark with the bottom around 110 ft. As a diving enthusiast it was great to go to a meeting where there is a plan to increase our diving environment especially since it seems to be well planned out. The tentative timetable is that in about two years to have the HMCS Terra Nova living on, in her next job, as increasing fish populations and divers in the area. I forgot to mention aas well that there is also a fund on going that hopes to bring a hyperbaric chamber to the area, which should recieve a big boost with the reefing project. Also the EOARA are not just looking at this one project but as the first of many projects to better our diving enviroment. 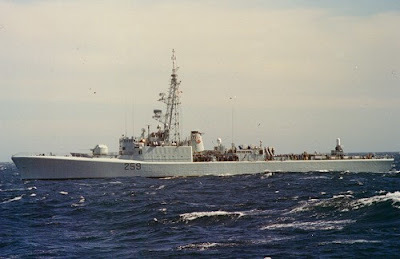 To all who assist H.M.C.S Terra Nova to her final resting place, I ask that she be treated with the respect she deserves after serving Canada for 38 years. She kept her crews safe in calm seas and hurricanes, in times of peace and war. I served on this great ship for 12 years on both coasts and fondly remember those years. These ships were the face of Canada for so many years we should show more respect for them and show it like they did with the sackville. I served in Terra Nova from 1975 - 1979. I have many fond memories of this fine old lady. I wish there was a reunion planned. It would be nice to see the "Boys" once again and hoist a few "Wets"